I was inspired to make this recipe after reading about the Raspberry Meringue Kisses - which sound delightful! Many people are intimidated by meringue, but it's really quite simple. Nothing more than whipping up some egg whites, sugar and cream of tartar and some vanilla (in this case) for flavor. 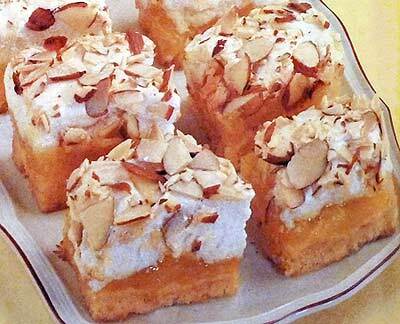 If you are a fan of lemon meringue pie, you just might fall in love with these easier to prepare bars. In a large mixing bowl, combine the cake mix, 1 egg and oil and blend until crumbly. Pat mixture into ungreased 13x9-inch baking pan. Bake for 15 minutes, then remove from oven and allow to cool slightly. Spread pie filling over partially baked crust. In another large mixing bowl, beat 6 egg whites until foamy. Add vanilla and cream of tartar and beat until soft peaks form. Slowly add sugar while beating until stiff peaks form. Spread meringue over pie filling and sprinkle with nuts. Bake an additional 15 minutes, or until meringue turns golden brown. Cool pan completely before cutting bars into desired size and shape.